Young Fresh Fellow’s Tiempo de Lujo is on sale for 24 hours only 60% off HERE at the Yep Roc Store! The album contains twelve songs recorded last year in guitarist Kurt Bloch’s basement in a twelve-hour session the long-time band members “booked” in order to have an excuse to get together. What resulted was a surprisingly cohesive grouping of twelve songs — hmm, that’s one per hour… seems like it shouldn’t have taken that long — seasoned bountifully with the energy and lyricism that YFF fans have come to expect. Buy the album HERE and watch the official music video for “A Fake Hello” from Tiempo de Lujo in the player below. 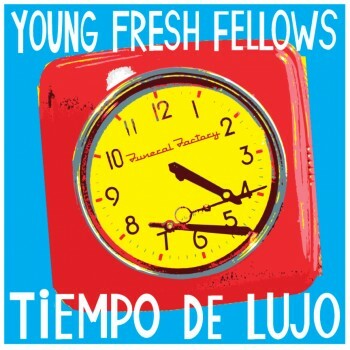 Young Fresh Fellows to Release New Album Titled Tiempo De Lujo on August 21. Give Young Fresh Fellows your best “Fake Hello” for a full-album stream the band’s upcoming release TIEMPO DE LUJO. Last week to take advantage of Yep Roc artists’ Amazon deals.